Mix together Bisquick™, milk, eggs, nutmeg, cinnamon and lemon zest in a large bowl until well combined. Divide batter equally into three separate bowls. Place a few drops of red and blue food coloring into one bowl (to create purple), green food coloring in another bowl and yellow food coloring in the third bowl. Stir in food coloring (with separate spoons for each bowl to avoid color contamination), adding more as necessary to reach desired color. Lightly grease a large skillet or griddle over medium-high heat. Pour slightly less than 1/4 cupfuls of batter (with a clean spoon or ladle for each bowl to avoid color contamination) onto skillet and cook until edges are dry and bubbles begin to form on the surface. Turn over pancakes and cook until golden brown. 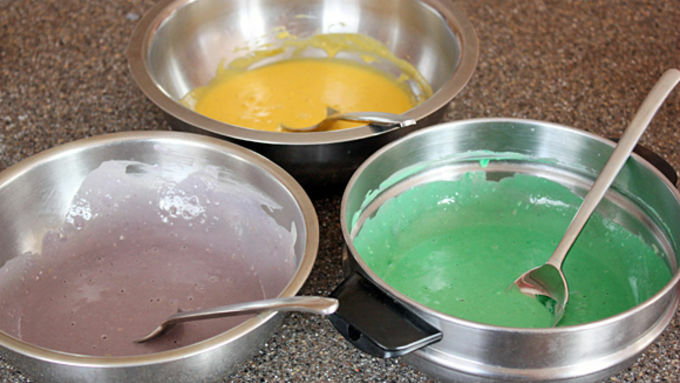 Place cooked pancakes in stacks of alternating colors on each plate and set aside. Make the icing: In a medium bowl, whisk together powdered sugar, lemon juice and water, adding more water as necessary to reach desired consistency (the icing should be like thick syrup). 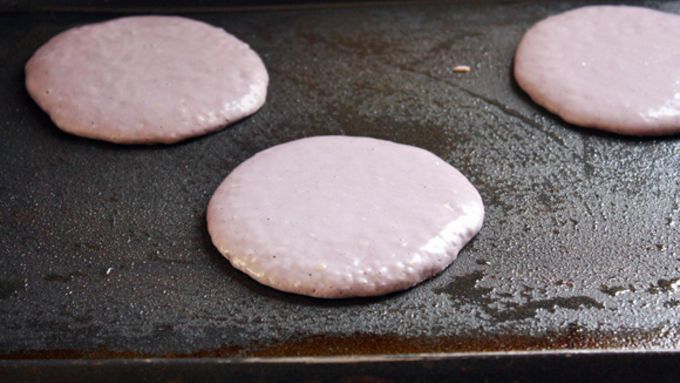 Pour icing on top of each stack of pancakes and sprinkle with colored sugar crystals, if desired. Happy Fat Tuesday, everyone! 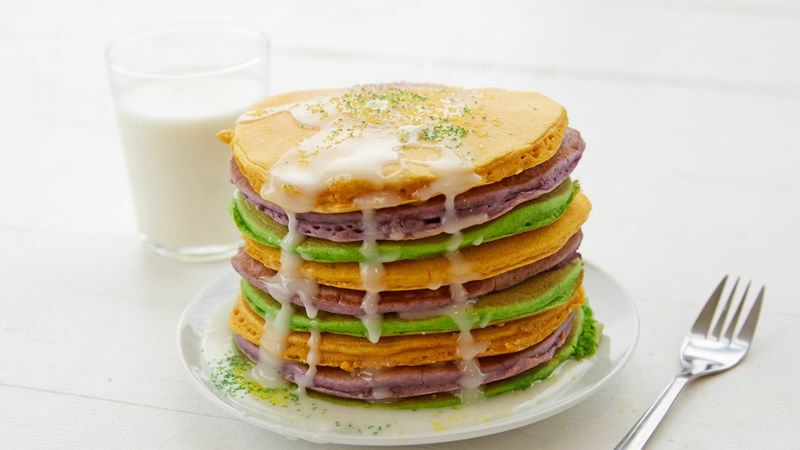 Kick off the Mardi Gras season right with a big ol’ stack of these festive King Cake Pancakes. You read right. 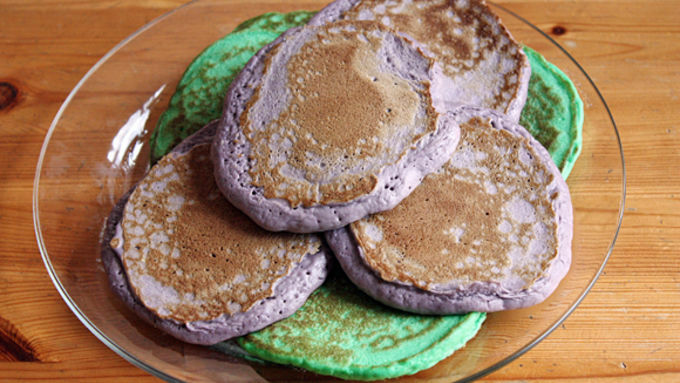 These pancakes taste just like traditional King Cake, but in breakfast form! They’re sweet, tart, easy to make and full of deliciousness – the perfect way to celebrate Carnival. Top that stack with a generous dollop of sweet, tart icing. And if that’s not enough sugar for you, top it all off with a sprinkling of colorful sugar crystals. Oh yeah. That’s how you celebrate. Now dig in and get ready to party.